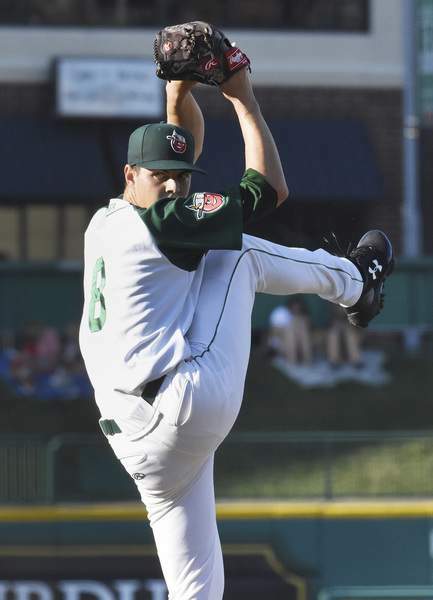 TinCaps starter MacKenzie Gore gave up two runs on three hits in five innings Monday night. The TinCaps have lost four games in a row for the first time in more than a month. To make matters worse, all four were at home and Fort Wayne now must go play six straight on the road, starting with a three-game series against Western Division-leading Cedar Rapids. Before the TinCaps travel to Iowa, however, they have a day off Tuesday, which comes at the perfect time for a team that needs a break. "It's quiet, for sure (in the clubhouse)," manager Anthony Contreras said after the game. "The only thing I told them today was that they need this off day more than anybody. They need to recharge their minds and their bodies and just get ready for the six-game road trip we're about to go on. "We wanna learn from the mistakes we made, but at the same time let's put it behind us and move forward." The TinCaps would like to move forward after a series against Bowling Green in which they did not score more than four runs in any game and got outscored 21-9 overall. Monday's loss came by a 6-1 score and featured quiet Fort Wayne bats, some bad luck with MacKenzie Gore on the mound and an uncharacteristically rough outing for Osvaldo Hernandez. The TinCaps got their only run in the fourth inning when Kelvin Melean ripped a double off the left-field wall and Luis Campusano drove him in with a bloop double to right. The hit broke a scoreless tie and was Campusano's first knock in 15 at-bats and one of his two hits in the game. Contreras said it was important for the catcher to have a good game before the off day. "He's been looking for a positive day," the manager said. "I thought he caught well. The two hits, he's been scratching at the bit to get back on his hitting streak. I think he needed that confidence booster, especially going into that off day. Especially when you're slumping, you don't want to go 0-for and then you're sitting there thinking about it." Campusano did catch well, but had some bad luck, as well. With Gore on the mound and the tying run on third in the fifth, the pitcher tossed a fastball low in the zone and it ripped through the webbing of Campusano's glove, going to the backstop for a passed ball that tied the game. It was a terrible break for Fort Wayne, which was compounded when Gore then gave up a double that put Bowling Green in front for good. "It's just kind of the luck," Gore said of the passed ball. "The mitt broke. What do you say? I didn't bounce back after that. I didn't make a good pitch." Other than that fifth, Gore was excellent, taking a no-hitter through four innings and striking out three in his start. He threw 77 pitches in five innings and gave up only the two runs. His fastball was spotted well on the corners at 94 mph consistently and his changeup was the best it's been all season, getting plenty of whiffs and weak contact. It was the first time he'd pitched on four days' rest in his pro career. Hernandez wasn't as good, enduring his worst outing in nearly three months. The 20-year-old left-hander gave up three runs on eight hits in four innings, though he did strike out four. It was the first time he'd given up more than two runs in an appearance since April 15, a span of 12 outings. The appearance raised his ERA to 2.25, dropping him out of the Midwest League lead in the category. The TinCaps are likely happy to be done playing Bowling Green, which won't return to Parkview Field this season. The Hot Rods improved to 60-28 with Monday's win, one of the best records in all of minor league baseball and they were the better team in this series, though Fort Wayne played hard throughout. All four games could have gone a different way, but none did. "This team today was really good," Contreras said of the Hot Rods. "Bowling Green won the first half for a reason, and they exploited us in certain areas that me as a coach I have to teach those guys how to defend that stuff. We'll get back to the drawing board and figure that stuff out."